Step by Step Nursery in Cumbernauld is just off Eastfield Rd, and is registered for 41 children. The nursery is designed and equipped to enrich those important first years of a child’s life in a safe and loving environment. Our nursery provides stimulating, thoughtful and exciting spaces for babies and children to explore and develop, guided and cared for by well trained staff. We offer an abundance of fun and exciting learning opportunities within high quality, safe and secure environments. We would love to show you and your child around. Why not give us a call and arrange a convenient time for you to view our nursery. Within our baby room we have space for 12 children aged between 6 weeks and 2 years old. This is a warm and cosy room where our younger children are cared for by a dedicated staff team. We understand the importance of building attachments from an early age, helping the children in our care feel safe and secure enough to develop emotionally and physically. Your child’s journey begins with a 6 week settling in program helping us foster positive relationships with all our new families. During this time you will have the opportunity to meet with staff and your child's key worker who will be responsible for planning and recording their developmental journey. The 2-5 room is designed to meet the growing needs of the children and we have a very effective Active Learning programme. We encourage creative play as creative play helps children flourish by using their own ideas and imagination. When a child is being creative they are thinking for themselves, they are interested in what they are doing and therefor engaged in play and ready to learn. Being creative lets the children explore, try things out, test ideas and make sense of their world. We value the importance of outdoor play. Children have open access to our large extensive garden. 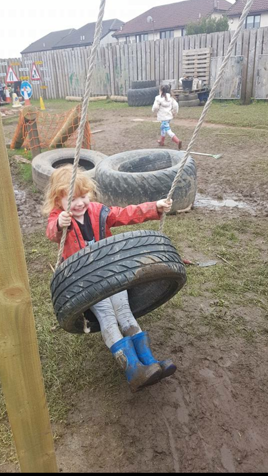 Spending time in the outdoors is vital to children’s health and wellbeing; this is why here at Step by Step Nursery we ensure all children get to enjoy fabulous experiences in the Great Outdoors. Your child is allocated a key worker within their room, who is responsible for your child's wellbeing, ensuring your child feels individual, secure and cherished while they are away from home. Your child’s key worker will liaise with you at the end of each day, keeping you informed of your child’s experiences at nursery and ensuring you don’t have to miss out on any aspect of your child's day. Your child’s key worker will update your child’s online learning journal regularly to allow you to have a visual insight of your child’s daily learning.